Tickets for the 12/7 event are available through The Boo. Tickets will also be available to purchase on the door of each event via cash or cheque. Join us for this new touring production from sensational storyteller Jacqueline Harris, who has previously delighted our audiences with productions such as ‘In Skriker’s Footsteps’ and ‘East o’the Sun, West o’the Moon’. This new show will be an intimate and immersive multimedia experience featuring projection, both a live and recorded musical score/soundscape and interactive, spontaneous storytelling. From mermaids to the mackerel lottery, prepare to be spellbound… This tour is brought to you by Litfest with support from Lancaster City Council and Arts Council England. Jacqueline Harris writes, tells and dramatizes stories based around folkloric and mythical themes, weaving audio, film, projection and community stories into her live performances. 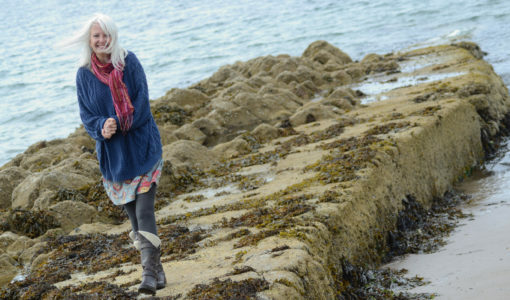 Her productions have toured across the UK including Edinburgh Fringe, Dingle, Spotlight Rural Touring and Hebden Bridge: Shaggy Dog Storytellers. For this project Jacqueline will be collaborating with freelance film maker Graham Kaye and composer, music producer and sound designer Lee Affen. Lee Affen is a composer, music producer and sound designer from Manchester, now based in Lancaster. His passion for music has led him to work in bands, write for singers and compose for theatre, film and dance. Alongside this, Lee also delivers music workshops and has worked on community based arts events and festivals around the UK. Graham Kay is a filmmaker and has been freelance since 2003. Prior to that he was a teacher in secondary and further education.